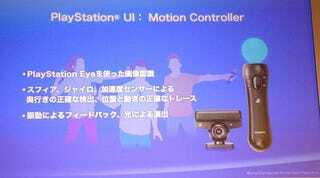 The Motion Controller's Spring debut has just been made official over at the Tokyo Games Show. A motion-enhanced Resident Evil 5: Director's Cut is planned, and the wand will work with a number of new and existing games, including LittleBigPlanet. A bunch of games will get motion control via a network update, including EyePet, Flower, High Velocity Bowling, PAIN, and Hustle King. And I really hope that's the norm when we hear what other game developer's plans are. Not every game can pull off a Director's Cut re-release (with motion control bonus) the way Res 5 might. On stage, Sony showed Resident Evil 5 being played with a dual shock controller in one hand, and the motion controller in the other. And for LittleBigPlanet, one player controlled Sackboy with the dual shock, while another used the wand to move special levers. The motion controller's glowing sphere changes color in context with the game.